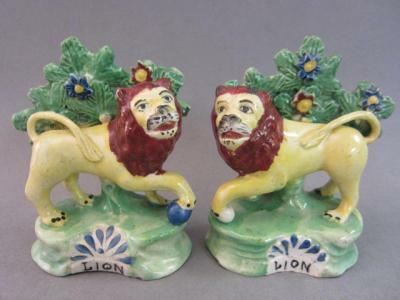 Ivan & David have been dealing in Staffordshire Figures, and most aspects of 18th & 19th Century British Pottery for over 30 Years. "Our interest in Pottery stems from a love of the items, and the history surrounding each and every piece. From the naïve charm of early 19th century Bocage Figures, to such varied ceramics as Sunderland Lustre, Transferware, Prattware, Creamware, Delftware & Gaudy Welsh. We have loved them all. For the first 15 years, our permanent Omega Planet Ocean Replica base was London’s Portobello Road. During those years, we began exhibiting at several major fairs in the United States, and have built many lasting friendships with both trade & private customers. Since leaving Portobello Road in 2000, we have concentrated our business supplying direct to our many regular customers, both at home and abroad. Our show calendar includes regular venues in Texas in the United States, and the Antiques for Everyone Fair at the NEC in Birmingham. Please see our Replica IWC Grande Complication calendar of events for details. We have recently created a great showroom in our village, where our ever changing stock is on view. The next time you are visiting North Buckinghamshire, please make an appointment to see us. We are available 7 days a week. We are committed to giving a personal service, with care and attention taken from purchase to delivery. We are happy to share our knowledge of Antique Pottery relevant to our merchandise. All of our items are guaranteed for age, authenticity, and any restorations are duly noted. We carefully pack each item ourselves, and often use Federal Express as our carrier of choice to the United States. Please feel free to contact us with any questions, or to locate a specific item."